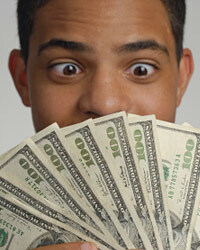 As a student, there are many situations in which you need money immediately and a “quick” student loan can help. Quick student loans are short-term loans that are advanced for a short period of time. Typically these loans also tend to be smaller loan amounts. They are used as a ‘bridge’ to future access to funds which may have been delayed. In this sense, they are similar to ‘payday loans’, where finance companies provide short-term loans which are repaid through post-dated checks; the check being dated for the next payday and the financier deducts an upfront fee while advancing the loan. Repayment time is short, usually no more than a month. The entire loan amount needs to be paid in one short amount of time, no installments are available. Interest rates are over and above normal interest rates, typically range at 20-25%. Some schools and colleges provide short-term bridge loans, so check with the school or college loan office first. Then, try large banks. Large banks will typically deposit the funds directly into your bank account. You can apply for quick student loans online. The loan application process is typically very easy and the loans can be closed as quickly as 10 days. However, remember to borrow within your means as otherwise it will affect your credit history. A parent or cosigner is a good option to keep rates low. Loans without collateral are charged a higher rate of interest. The application requires that you document you are enrolled in school. Then, you will then get a loan that will cover your tuition fee as well as living expenses. You can borrow up to $100,000 and $150,000 for undergraduate and graduate studies, respectively. Make sure that you calculate how much you have to repay each month in the future and decide on the borrowable amount. This is crucial to avoid a bad credit report in the future. It is best to build a good credit history with your lender by taking small loans that you can repay on time first. This will lessen your interest burden when you apply for a larger loan, thereby leading to substantial savings for you. When applying for no credit check loans, choose a lender that offers the lowest interest rate and does not charge a fee for processing your papers. Before opting for a quick student loan to ease your financial burden, ensure that you’ve weighed the pros and cons carefully and are in a position to repay the full amount by the due date. It is also important that you use the money for the purpose it was borrowed and not squander it away on useless requirements.